Project 1: T-shirt Pillow Cover. You pick the size pillow you want (16″x16″ pillow form used here), your favorite t-shirt and some coordinating fabric. In about 90 minutes, you’ll have a one-of-a-kind pillow that YOU created. The envelope style pillow cover means no snaps, buttons or zippers to contend with. Perfect for beginners. If you can wind a bobbin, thread your machine and sew a straight seam without sewing your fingers together, then you have the skills necessary to make this project. 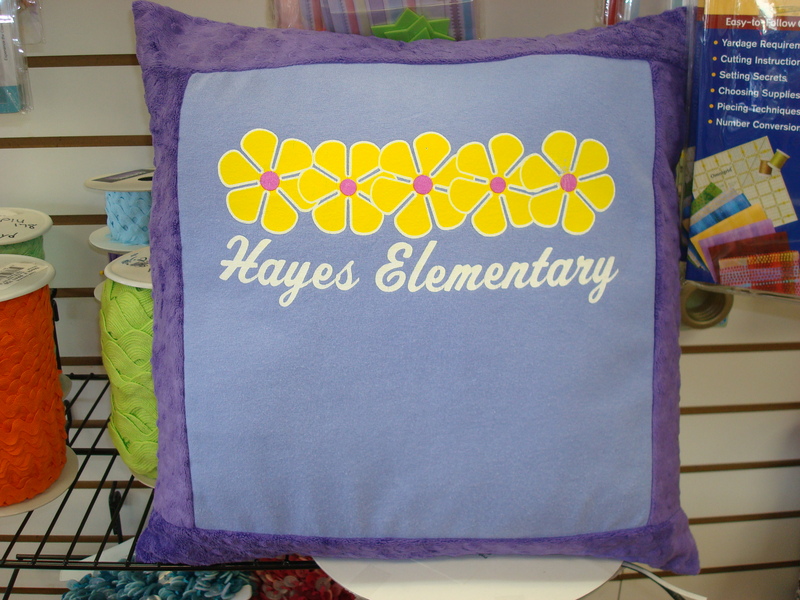 Fabric requirements for a 16″ square pillow cover: 1/4 yard for trimming the t-shirt, 1/2 yard for the back and 1/2 yard lightweight fusible interfacing to stabilize the t-shirt. All the fabrics for this project came from my stash. Pillow form is from Joann’s.